Transparency Market Research (TMR) has published a new report titled, “Gram-Positive Bacterial Infections Market - Global Industry Analysis, Size, Share, Growth, Trends, and Forecast, 2018–2026”. According to the report the global gram-positive bacterial infections market was valued at US $ 51,457.9 Mn in 2017. It is projected to expand at a CAGR of 1.5% for the forecast period of 2018 to 2026. 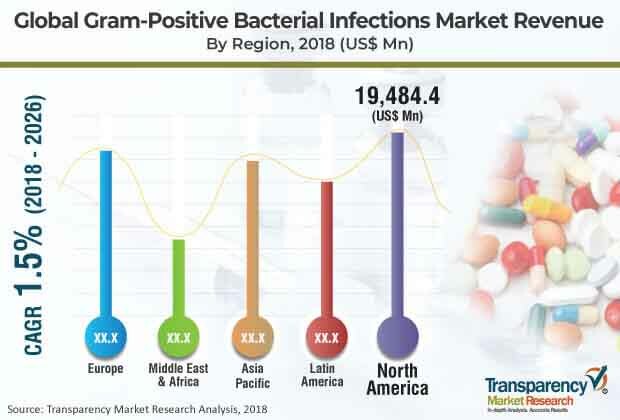 The gram-positive bacterial infections market is projected to expand during the forecast period owing to an increase in the number of cases of gram-positive bacterial infections and rapid rise in antibacterial resistance. Moreover, factors such as increased government initiatives and funding for R&D activities & newer bacterial infection treatment and infection control in healthcare settings drive the global gram-positive bacterial infections market. North America dominated the global gram-positive bacterial infections market and is expected to maintain its position owing to a rise in the prevalence of bacterial infections, better diagnosis, and treatment rate in the region. Asia Pacific is a lucrative market for gram-positive bacterial infections. The market in Asia Pacific is expected to expand at a CAGR of 1.9% during the forecast period. Rise in the number of infection cases due to gram positive bacteria is a major factor driving the global gram-positive bacterial infections market. These infections are more prevalent in recent times, which need better antibacterial drugs to cure. For instance, according to the study done by team of scientists from the University of Oxford, U.K. and the NHS Foundation Trust, U.K., cases of community-acquired pneumonia increased by 4% between 1998 and 2008 and 8% between 2008 and 2014, respectively. Rapid rise in antibacterial resistance and infection control in health care settings is also boosting the global market. For instance, according to the U.S. Centers for Disease Control and Prevention (CDC) estimates, antibacterial resistance is responsible for over 2 million infections and 23,000 deaths in the U.S. each year. Similarly, increased government initiatives for newer bacterial infection drug discoveries is also major driver of the global gram-positive bacterial infections market. Antibiotic is a dominant segment of the gram-positive bacterial infections market. It is expected to maintain its position and account for 62.2% share of the market by 2026, expanding at a CAGR of 1.4% between 2018 and 2026. The segment is anticipated to reach a value of US $ 36,535.9 Mn by 2026. Efficacy of antibiotics in treating a wide spectrum of bacterial infections and development of novel approaches for new antibiotics are likely to propel the segment of the global market during the forecast period. Sinusitis was a dominant segment of the gram-positive bacterial infections market in 2017. It is expected to maintain its position and hold 43.4% share of the market by the end of 2026. The otitis segment is anticipated to reach a value of US $ 2,252.8 Mn by 2026. It is projected to account for 3.8% share of the market by 2026 and expand at a CAGR of 3.1% during the forecast period. Otitis is a highly lucrative segment due to a rise in the prevalence of otitis media and the efficacy and safety of antibacterial agents to cure the infection. In terms of route of administration, the global market has been segmented into enteral, parenteral and others. The enteral segment held a major market share of the global market in 2017. It is anticipated to expand and account for a prominent share of the market during the forecast period. The enteral segment is projected to hold 66.9% share by 2026. The others segment is likely to expand at a CAGR of 2.1% during the forecast period. Expansion of this segment can be attributed to ease of use, lower risk of developing bacterial resistance, and higher concentrations in infected areas. In terms of distribution channel, the global market has been classified into hospital pharmacies, drug stores and retail pharmacies, and others. The drug stores and retail pharmacies segment held a major share of the global market in 2017. It is estimated to expand and hold a prominent share of the global market during the forecast period. The drug stores and retail pharmacies segment is projected to account for 57.6% share of the market by 2026 and expand at a CAGR of 1.8% during the forecast period. However, the others segment, which consists of online pharmacies, mail pharmacies and home care pharmacies, is more lucrative segment. It is expected to expand at a higher CAGR of 2.4% during the forecast period due to better discounted rates on drug purchase and convenience offered by online pharmacies. In terms of region, the global gram-positive bacterial infections market has been segmented into five major regions: North America, Europe, Asia Pacific, Latin America, and Middle East & Africa. North America dominated the global market in 2017. The market in North America is projected to expand at a CAGR of 1.3% between 2018 and 2026. In terms of revenue, the market in North America was valued at US$ 19,222.8 Mn and the region held 37.4% share of the global market in 2017. This was due to a rise in the prevalence of bacterial infections, better diagnosis and treatment rate, and presence of major players in the region. The antibiotic segment dominated the market in the region. It is estimated to expand at a CAGR of 1.2% during the same period. Asia Pacific is projected to be a highly lucrative market and expand at a CAGR of 1.9% during the forecast period due to larger patient pool with bacterial infection, generic drug availability, and increase in awareness about various infections among the people in the region. The global gram-positive bacterial infections market is fragmented in terms of number of players. Key players operating in the global market include Bayer AG, Pfizer, Inc., Sanofi, GlaxoSmithkline plc (GSK), Merck & Co., Inc., AstraZeneca, Theravance Biopharma, Bristol-Myers Squibb Company, Novartis AG, and Allergan plc. R&D activities, more product pipelines, and merger & acquisitions with local players are major strategies adopted by these players in the global market.